BLANCO, the German manufacturer of finely made sinks and faucets, announces the release of the first-ever SILGRANIT apron front sink. The revolutionary IKON™ Apron Front Single Bowl breaks ground with its ability to offer a highly sought after aesthetic with the unmatched quality, color selection and resilience of SILGRANIT. The perfect combination of design, function, and durability, the innovative IKON features a sophisticated apron front design with a traditional wide radius and robust 1.5” rim. 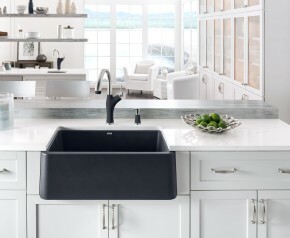 BLANCO also offers a unique custom-fit Floating Grid accessory for use with the IKON, which rests along the walls of the sink and can be used as an additional workstation for prepping and cleaning, or as a trivet on the countertop. Since the grid is not needed to protect the sink surface, it floats gently above the sink bottom (above debris and water) to be used as a multi-tasking work area that’s clean and easy to reach. The BLANCO IKON will be available in three on-trend neutral colors, Anthracite, White and Café Brown. The custom-fit floating grid is expertly designed to handle the weight of pots and pans, while gently resting along the IKON’s inner walls to provide added comfort while prepping and cleaning. With the most colors, designs, and durability, BLANCO has been the leader in granite, granite-like and composite sinks since 1981. For a generation, BLANCO has continuously developed and perfected our own exclusive industry-leading SILGRANIT material, which now features a new, smoother surface that is easier to clean. SILGRANIT sinks are beautifully designed and scientifically proven to be scratch, stain and heat-resistant, which makes the IKON apron front sink extremely durable. The sink is one of the most heavily used areas of the kitchen – and apron front sinks experience more contact than traditional undermount sinks. The science behind SILGRANIT offers a level of protection that ensures that the apron front on the IKON won’t scratch, and will maintain its beauty after years of use.